I’ve been catching up on my hip-hop education reading, and just finished Marc Lamont Hill’s award-winning 2009 book Beats, Rhymes, and Classroom Life. Dr. Hill has become a popular and controversial public intellectual, currently the host of HuffPost Live and BET News and a political contributor for CNN, among other venues. Just last week I caught him on the Nightly Show panel discussing police violence. But in this book, we see another side of Hill’s intellectual life — the careful young anthropologist and teacher, exploring the intricacies of the spaces where hip-hop meets education. Six years after first being published by Teachers College Press, and against the rapidly growing backdrop of hip-hop ed research, Hill’s book continues to stand out. It is a study of a high school course that Hill co-taught in Philadelphia called Hip-Hop Lit, in which students used literary criticism to analyze rap texts. As hip-hop ed goes, the course is pretty traditional — analyzing rap texts is the most common way that teachers integrate hip-hop into the curriculum. 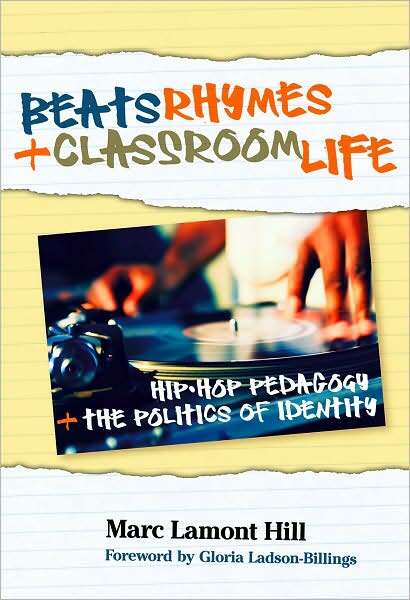 What makes Beats, Rhymes, and Classroom Life stand out is Hill’s broad ethnographic approach, and his willingness to problematize hip-hop ed even as he outlines its potential. Hill is not simply evaluating the success of the course. Rather, he is studying the class as a cultural space in which both students and teachers are actively negotiating their own identities, experiences, and worldviews in conversation with one another and the content. Chapter one and two introduce the hip-hop education field, the school context, and the Hip-Hop Lit course. The course was designed to teach literary analysis and criticism. Unlike traditional lit crit courses, however, Hill sought to center the “experiences, values, and codes of the hip-hop community,” as well as the lives and stories of the students themselves. Toward this end, Hill selected 28 rap songs as course texts, divided across six themes. Students read and discussed the texts, wrote journals, and completed individual and group projects. Students learned traditional lit crit concepts and strategies, but these are not Hill’s focus in the book. Instead, he is interested in, as the subtitle says, the “politics of identity” that taking place in the classroom community both through and around the literary criticism. In chapter three, Hill looks at how students negotiated “authenticity” in the course, framed around hip-hop’s perennial concern with “the real.” He recounts student debates about what makes a particular artist or song “real hip-hop.” Some students associate the term with underground, non-commercial artists, while others use it to describe artists from “the hood” who rap about “the streets.” He links these debates with the idea of literary “canons,” and how questions of artistic taste are used to stratify social groups. Always self-reflective, Hill points to his own complicity in this process as the designer of the course curriculum. Hill goes on to discuss the factors that led students to see particular rap narratives as “real” or relevant to their lives, an important question for the development of culturally relevant or sustaining pedagogies. His students were often attracted to narratives that were local (about Philadelphia), oppositional, and that made room for students to draw their own morals from the story. Perhaps the most intriguing part of the chapter looks at notions of Blackness, and how students constructed both hip-hop and the class as “authentic Black spaces.” This led students and teachers to place a high value on Black language and cultural capital, which are marginalized if not outright banned in other classroom spaces. Hill says that this facilitated effective pedagogy for many students. At the same time, he challenges the field to recognize new forms of marginalization that emerged. White students, as well as Black students who did not see themselves as fitting into certain stereotypical constructions of “real” Blackness, expressed feelings of being “othered” and silenced in the space. Hill does not use this fact to condemn the centering of Blackness, but rather to challenge educators to take this marginalization into account, and to think more fluidly about identity in our attempts to be culturally specific and relevant. My use of “healing” neither presumes nor suggests a completed medical, psychological, or ideological recovery. Rather, it refers to the process by which members of Hip-Hop Lit were able to find varying levels of insight, relief, support, empathy, and critique within the Hip-Hop Lit community for their personal and ideological wounds. Hill’s exploration of wounded healing points to what may be the most important lesson from this book for educators wanting to do culturally relevant or culturally responsive teaching: it can be emotional and painful for both students and teachers. Too often cultural relevance is discussed as if it were merely a matter of aligning school and home cultures, but if we are truly committed to making space to value the experiences and narratives of young people of color, that means engaging directly with stories of pain, misery, and structural oppression that teachers may not be ready for, and which require more than a nod of solidarity — they require careful critical analysis and the difficult work of building a classroom community. Chapter five looks at the memory work carried out by students and teachers, framed around a discussion of “Things Done Changed” by the Notorious B.I.G. Hill describes including the text in the course as a way to talk about the social forces at work in US inner cities. The students, however, read it as a confirmation of a historical narrative about their generation’s moral inferiority in the face of challenges that their parents and grandparents’ generations did not have to deal with. “Things” have gotten worse, and young people have gotten worse with them. This “discourse of decline” can be problematic in its simplifications of the past, but can also be a source of activism, a way of critiquing present conditions in order to change them. Pedagogies of Hip-Hop refers to the many ways that engagement with hip-hop culture fosters knowledge, habits, worldviews, and cultural production among participants. Pedagogies about Hip-Hop refers to the critical analysis and (re)production of hip-hop cultural products. Pedagogies with Hip-Hop describes the use of hip-hop cultural products and aesthetic forms to teach a range of academic subjects. Hill finishes the book with a reflection on his own complex positionality as a teacher/researcher, insider/outsider in the class, in the best traditions of reflexive anthropology. With this book (and his previous articles on the study), Hill set a high bar for thoughtful ethnographic study of hip-hop pedagogy, and has helped to propel hip-hop ed scholarship beyond simple advocacy pieces (as necessary as they are) toward a deep and critical wrestling with questions of identity, culture, and power.